Summer to me means either icy tones to match my love of white clothing, or bolder shades to match the weather. 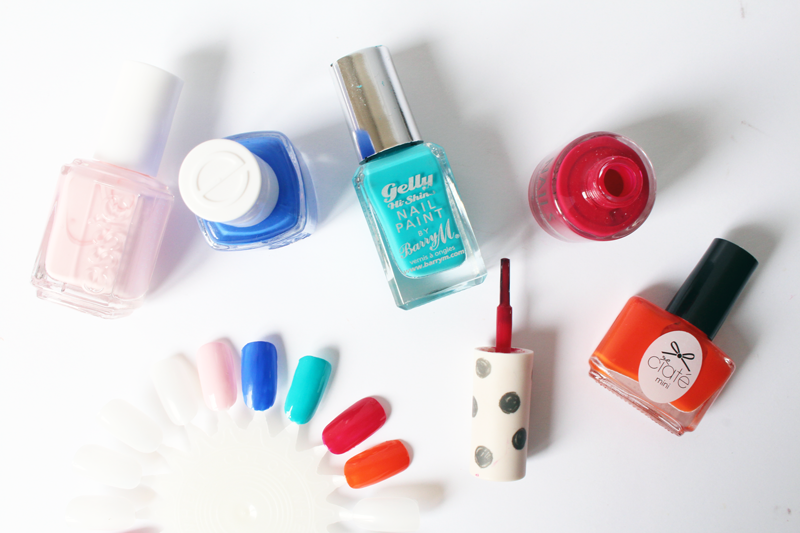 Today, I’ve opted for some brights as it’s been particularly nice up North recently! I finally got my hands on Essie Fiji after months and months of lusting after it. It’s the perfect pale pink that makes a change from wearing white and applies so nicely. Same as Essie Butler Please, which is so much brighter on the nails than it is in the swatch above. It’s such a gorgeous shade, the perfect contrast to a monochrome outfit. Essie polishes are one of my favourite brands so they’re always a go to in my collection! On twitter the other day, I was going on about how I wanted to paint my nails with Barry M Guava but didn’t have it. …Turns out I’m some sort of nail polish hoarder because I actually had it all along! It’s such a great, bright shade and the perfect turquoise! Raspberry is a good option all year round and a recent one I’ve been loving is Topshop One Hot Minute. Again, it’s brighter on the nails and is a great little choice. Finally, I have a bit of a thing for Ciate mini’s and my favourite has to be Ciate Hopscotch. It’s such a juicy (yup) bright orange, not neon but gives nails such an oomph. The ideal summer shade! Previous Post TODAY: One Coat Three Ways + A Giveaway!